I have never wanted to put quotes around something as much as the word "Italian" in the title of this post. I'm sure that there is nothing Italian about wrapping risotto infused with either tomato or squid around cheese and deep frying it. 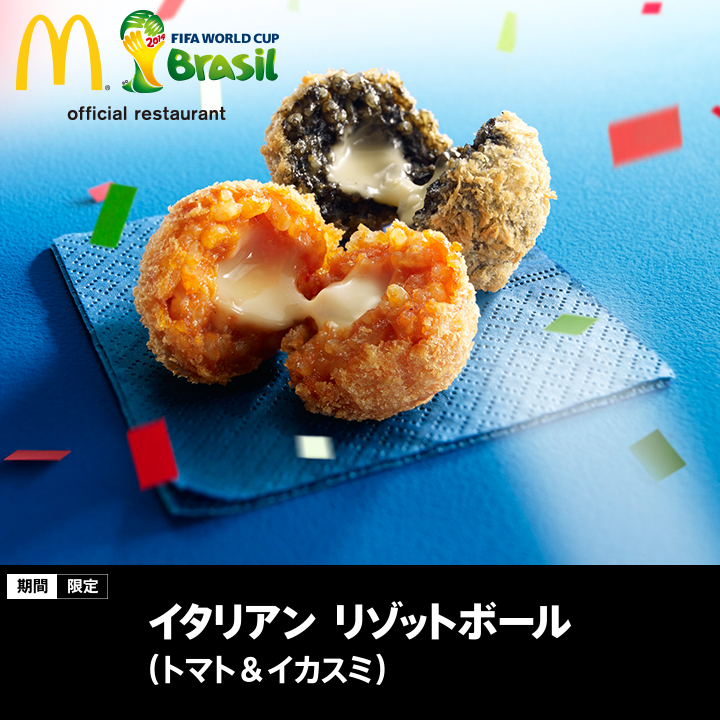 This abomination is part of McDonald's way of celebrating one of the world's most popular sports. There is no greater way to tip your hat to feats of athleticism than to eat fried balls of cheese and risotto. Amazingly enough, these are a respectable Italian food called suppli or arancini ("oranges")--or at least the tomato version is. I have the feeling McDonald's doesn't do them justice, though. You can tell that I don't know anything about Italian food. ;-) I am surprised that they deep fry much of anything as I don't associate deep fried food with Italy... however, we are right back to my lack of knowledge about their food.